Eating family meals together is the best recipe for encouraging good eating habits, healthy body weight in children and adolescents, and reduced risk for eating disorders. Kids who break bread with their families also get better grades in school, eat more fruits and vegetables, and consume fewer soft drinks. Despite the benefits to both body and soul, just 30% of families eat dinner together every night. This session explores the benefits of, barriers to (some of them may surprise you), and creative and doable strategies for nurturing family mealtime. List and discuss two evidence-based benefits to eating family meals together. Understand the five most common barriers to family mealtime. Identify and implement creative strategies aimed at helping families increase the frequency of eating meals together. Liz Weiss, MS, RDN, has been cooking up practical ways for families to eat well and break bread together for over three decades. She is a mom of two grown boys and one of the first dietitians to harness the power of social media to communicate sound nutrition science to consumers. Liz began her communications career at CNN where she produced and reported on nutrition news, food safety breakthroughs, and culinary trends and innovations. Other media roles included five years reporting on nutrition for PBS HealthWeek and the creation of 50 “Meal Makeovers” cooking videos, which appeared on CNN’s Accent Health channel in doctor’s offices nationwide. Liz is the voice behind the family food podcast and blog, Liz’s Healthy Table. 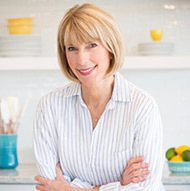 She interviews expert guests, shares recipes, and inspires parents to cook with their kids and eat meals together. She is the co-author of No Whine with Dinner and The Moms’ Guide to Meal Makeovers and the author of Color, Cook, Eat!, a playful and unique coloring e-book series. Liz writes for Today’s Dietitian RDLounge and is a past columnist for Kiwi Magazine and Nick Jr. She served on the Wellness Committee in her children’s school for 12 years and currently volunteers for two hunger-relief groups: Lex Eat Together and Mazon. Established in 1996, The Food Marketing Institute Foundation is a 501(c)(3) charitable organization that seeks to ensure continued quality and efficiency in the food retailing system and is operated for educational and scientific purposes. To help support the role of food retailing, the FMI Foundation focuses on research and education in the areas of food safety, nutrition, and health. For more information, please visit www.fmifoundation.org. 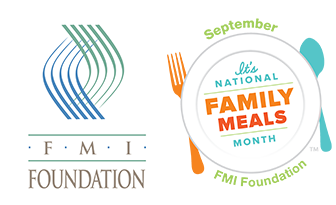 Created in 2015 by the Food Marketing Institute (FMI) Foundation on behalf of the nation’s food retailers, National Family Meals Month™ (NFMM) dedicates the month of September to encourage families to enjoy one more meal at home each week. Family meals eaten at home strengthen the family’s social fabric and promote healthier eating. With the proven benefits of combating obesity and deterring unhealthy behaviors such as substance abuse, family meals contribute to a healthier community and nation. In addition, the FMI Foundation’s promotion of NFMM encourages food retailers, suppliers and community collaborators to provide solutions for more family meals at home. For more information, please visit www.fmifamilymeals.com. Liz Weiss, MS, RDN, has no relevant disclosures to report. She has certified that no conflict of interest exists for this program. This complimentary 1-credit continuing education webinar is brought to you with support from The Food Marketing Institute Foundation. Please note that The Food Marketing Institute Foundation provided financial support only and did not have input into the information provided in this course. View our disclosure policy.